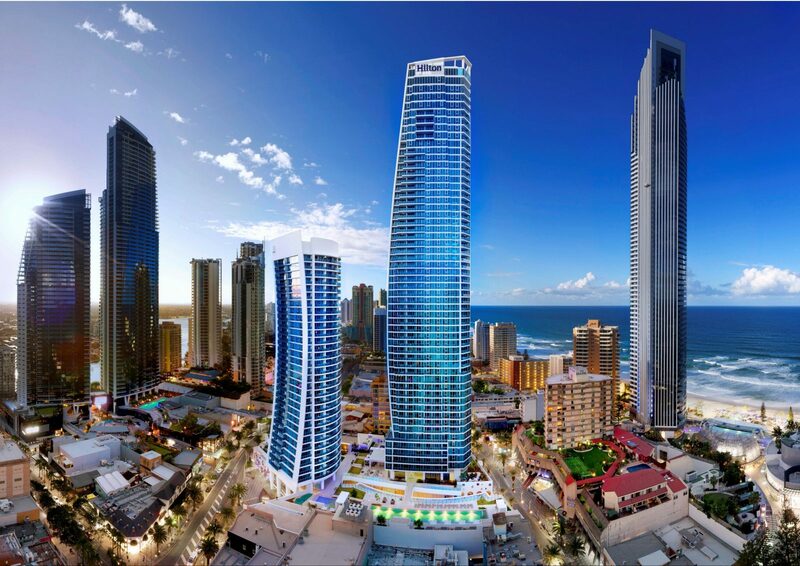 Located between Orchid Avenue and Surfers Paradise Boulevard, the hotel embraces the energy and excitement of one of Australia’s most dynamic hot spots and puts a host of shopping, dining, and entertainment right at your fingertips. As the very first Hilton hotel in Australia to offer a combination of 169 stylish hotel rooms and 200 spacious residences, Hilton Surfers Paradise caters for families, couples, groups and business travellers alike. The hotel’s inviting guest rooms and suites are modern and sophisticated and the residences provide the ultimate in comfort and convenience; all with the benefit of Hilton’s renowned hospitality and services. 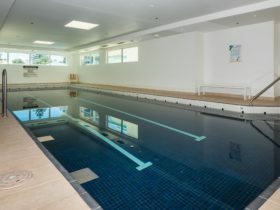 Throughout the hotel there is no compromise on quality. The hotel’s signature restaurant, Catch, is well known for its hearty breakfast buffet and evening a la carte menu and is complemented by a lobby café, a cocktail bar, the relaxing eforea: Spa and a host of recreational facilities including four pools, a spa, sauna, two gymnasiums, a mini cinema and Executive Lounge. Feel the stress melt away in a Relaxation Room, where spanning windows showcase breathtaking vistas over the beach and ocean. The additional space in this 54 square metre room provides the ideal environment to enjoy a freshly-brewed pod coffee. A bathroom complete with walk-in shower, and luxury Crabtree and Evelyn amenities, is an indulgent space to rejuvenate the senses and for the ultimate escape retreat enjoy access to the hotel’s spectacular 15th floor Executive Lounge, offering panoramic views over the best of the Gold Coast, continental breakfast, sunset drinks and antipasto. Located on levels four to 15 of the Orchid Tower. Soak up some of the most spectacular ocean views on the Gold Coast from the panoramic windows that frame a Two Bedroom Deluxe Ocean Residence. Modern, stylish and ultra-spacious these Residences combine Hilton’s world famous service and hospitality standards with contemporary, apartment style living to deliver a truly exceptional accommodation option. Separate living and dining areas, private balconies and oversized bathrooms, create the ultimate retreat for families, friends or group stays. Intelligently designed to be the ultimate restful retreat, a Relaxation Suite features a separate living space for you to relax and unwind. Rejuvenate in the beautiful bathtub with Crabtree and Evelyn amenities, take in views of the Surfers Paradise skyline from the balcony, enjoy the perfect cup from the pod coffee machine, or listen to your favourite music on the Bose docking station. Best of all each Relaxation Suite includes exclusive access to the hotel’s private Executive Lounge on the 15th floor, with its superb Gold Coast views continental breakfast, sunset drinks and antipasto. Located on levels four to 15 of the Orchid Tower. 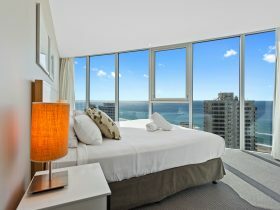 Imagine waking up to the picturesque outlook of the Surfers Paradise skyline and glorious Gold Coast. Located on the upper floors of the hotel, level 33 and above, a Two Bedroom Sky Residence takes indulgence to a whole new level combining the exceptional benefits of a modern kitchen and laundry, separate living and dining areas, private balconies and over-sized bathrooms with all of Hilton’s five star services. The Sky Residences are nothing short of breath taking, enjoy the picturesque views as you soar more than 80 metres above the spectacular city. 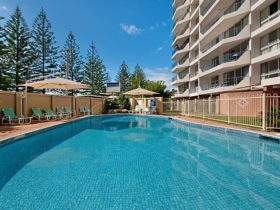 Enjoy views of the Surfers Paradise skyline or Gold Coast Hinterland as you relax in the comfort and style of a Guest Room with contemporary decor, a king size Hilton Serenity bed and luxurious Crabtree and Evelyn amenities. Watch a movie on the 37 inch LCD television, listen to your favourite music with the iPod docking station and stay connected with high-speed internet access. Located on levels three to six of the Orchid Tower. Relax in this contemporary and spacious room which has been specifically designed to perfectly accommodate the mobility impaired with strobe alarm and large bathroom featuring roll-in shower and grab bars. Enjoy plenty of natural light and views of the Gold Coast Hinterland or city. 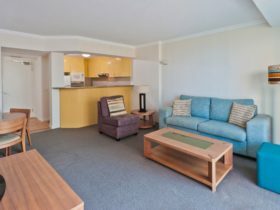 With King or Twin bedding (on request), 37 inch LCD television and iPod docking station for your enjoyment, you can relax in contemporary surroundings in the heart of Surfers Paradise. Special touches include daily newspaper, Bespoke pillow menu and luxury bathroom amenities by Crabtree and Evelyn. 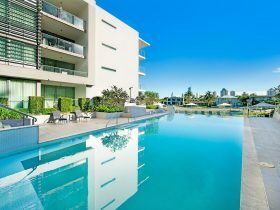 In a sky high Three-Bedroom Deluxe Ocean Residence, the panoramic views over Surfers Paradise are just the beginning. For families and groups, this is the perfect accommodation solution. With three bedrooms and two bathrooms, space is abundant and rooms are infused with natural light through the vast windows. Add to this the versatile open plan layout featuring separate living and dining areas, and the levels of luxury and convenience are irresistible. The kitchen, complete with every imaginable appliance, awaits should you want to prepare a meal. Soak up everything the Gold Coast has to offer from your own balcony with glimpses of the ocean and Surfers Paradise beach. Enjoy a great nights sleep in your modern Deluxe Room with a king size Hilton Serenity bed, down pillows and luxurious linens. Each room features a 37 inch LCD television, iPod docking station, high-speed wireless internet access and an elegant bathroom, with luxury bathroom amenities by Peter Thomas Roth. Located on levels six to eleven of the Orchid Tower. 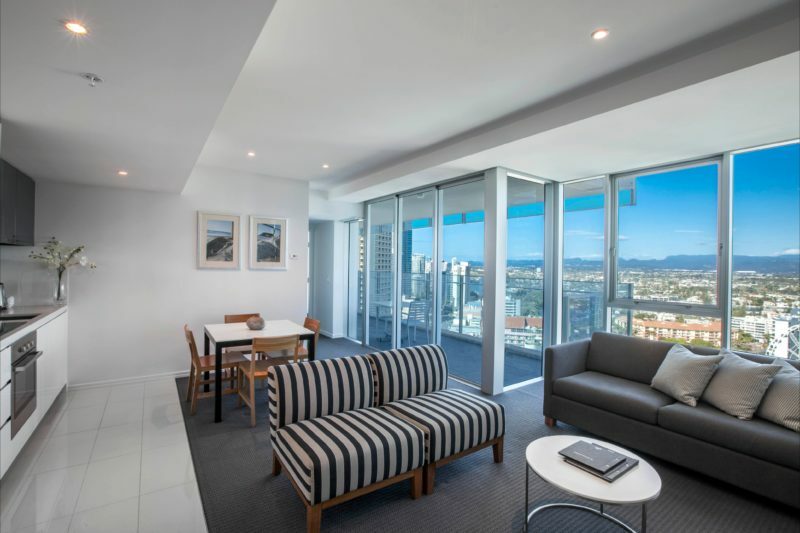 Enjoy the view in a One Bedroom Residence, where vast windows frame a panorama of the beautiful Gold Coast Hinterland and Surfers Paradise skyline. The versatile open-plan layout of an extra-spacious Residence and the convenience of a modern laundry and fully-equipped kitchen with state of the art appliances makes it an ideal retreat for a few day or a few weeks. The Residences are made even better with Hilton’s world-famous service and hospitality coming as a standard. The spectacular Four Bedroom Deluxe Ocean Residence is ideal for families and groups, comfortably sleeping up to 10 people. Prepare meals in the fully equipped kitchen, complete with Miele appliances, which overlooks the generous living and dining areas, as well as the clear blue waters of the Pacific Ocean. The master bedroom with en suite bathroom can transform into a room with two single beds, and three additional double rooms offer more space and privacy. Enjoy all the comforts of home with functional amenities such as a washing machine, dryer and laundry tub, and stay entertained with a 37 inch television and iPod docking station. Special touches include fluffy bathrobes, slippers and magazines. Modern, spacious and sophisticated, an Executive Room offers partial ocean, city or Hinterland views and access to the hotel’s spectacular fifteenth floor Executive Lounge with daily continental breakfast, sunset drinks and antipasto. Enjoy a movie and kick back on your king size Hilton Serenity beds with your favourite music on the iPod docking station, or get connect with the high-speed wireless internet access. 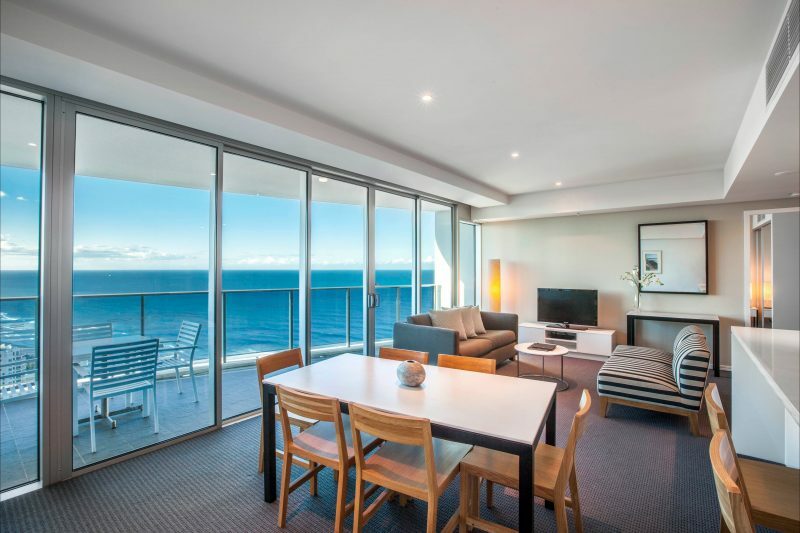 Request a bath or a balcony and soak up the atmosphere of Surfers Paradise. Located on levels 12 to 15 of the Orchid Tower. World renowned Hilton hospitality meets spacious contemporary living in a Two Bedroom Deluxe Residence. With separate living and dining areas, private balconies and over-sized bathrooms, as well as all the convenience of your own kitchen and laundry, these generous Residences have everything you need for a relaxing stay with family or friends – and then some. Vast windows infuse the space with abundant light, and showcase spectacular views of Surfers Paradise and the Gold Coast Hinterland. With Hilton’s world-famous service coming as a standard, the Residences really do offer the best of both worlds. Experience the sheer indulgence of Hilton Surfers Paradise’s breathtaking four bedroom, five bathroom Sub Penthouse Suite. Exemplifying Hilton’s impeccable style and level of service the Sub Penthouse Suite features immaculate design, awe-inspiring views of the Pacific Ocean and comes with the ultimate convenience of local airport transfers and a “Personal Valet” to assist with every aspect of your stay, including any special requests. The Sub Penthouse Suite provides separate living and dining areas, a fully equipped laundry, and kitchen with De longhi appliances, designer furniture and art pieces, built in surround sound, and state of the art mood lighting. Pure bliss. Seasonal pricing applies. 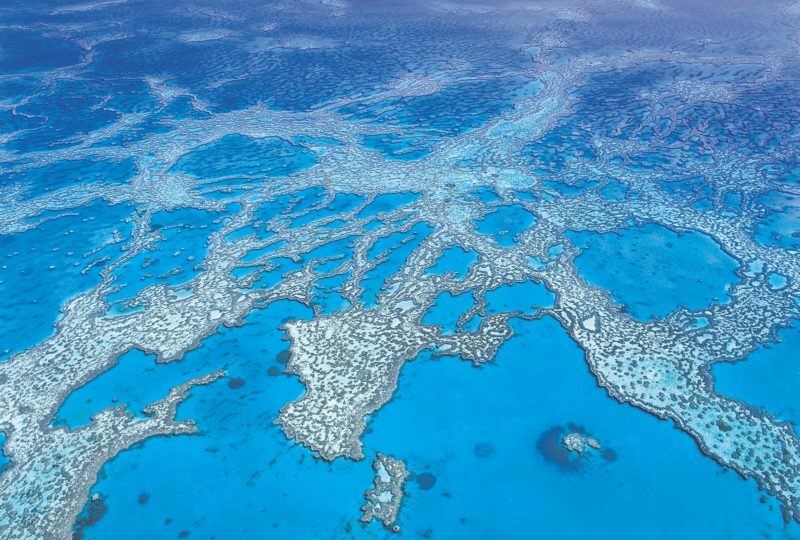 Guest Rooms from AUD179 to AUD519 per night. 2 Bedroom Residence Ocean View AUD269 to AUD839 per night.